This nutty yokel was described in his local village newsletter as being "Very humorous!" And he is! The talk of Somerset, cheeky Tom has a humorous take on just about every aspect of country life. 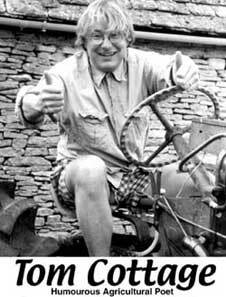 From Tractor Rage to Bloomin' Vegetarians, his gentle, humorous poems will have you gagging on your cider! When not entertaining the rural community, Tom likes nothing better than a game of darts and a few beers down at his local. A totally down to earth bloke! Tom is also a sports fan and regularly competes in tractor driving competitions. Last year he took third place in the Somerset and Gloucester Tractor Derby. Tom has recently published his first book of poems "Digging For Apples", which is available from the author. Tom also grows his own vegetables.